With their car weighing in at 672 pounds—almost 200 pounds lighter than last year—DFR drivers Leina McDermott '19 and Allie Stasior '20 logged 75 meter acceleration runs ranging from 6.5 to 5.1 seconds. "For perspective," said Raina White, Thayer Lab Instructor and DFR team advisor, "a few production cars warmed up the track with acceleration times of 4.7 for a Tesla and 5.2 for a Bolt." Princeton, with an all electric vehicle, logged the fastest Acceleration Event time at 4.9 seconds. "Although not as fun to watch, but more exciting in my opinion," added White, "is that Dartmouth placed first in the design event, where industry experts evaluate the quality of their engineering work. Students are asked questions regarding their design decision making, supporting analysis and validation, and general understanding of the vehicle behaviors." “The thing that’s really cool to me, that I wouldn’t have expected, is the willingness of all the teams to help each other out," said Max Schwegman, a Princeton senior. "It’s a lot more of a ‘we’re all in this together’ atmosphere than I would have thought. The amount of camaraderie here is pretty remarkable." 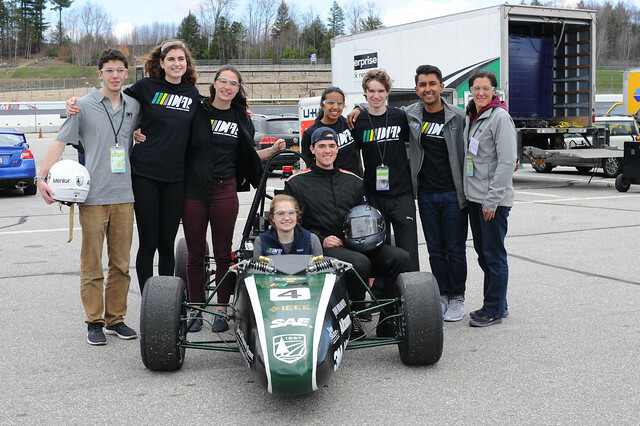 “[Formula Hybrid]’s not only job skills and personal skills, but it’s also seeing it all put together," said George Spearing, a first-year student at UVM. "It’s so much different than seeing it as a model on a computer. Everything you worked on is all together and working in front of you. It’s a beautiful experience. Seeing the application of so much that I’m learning in automotive, it’s actually solidified this as as a potential direction I want to go. There are so many different opportunities and fields, and then, wow, here’s a race car. I didn’t think of this as a direction to pursue before."